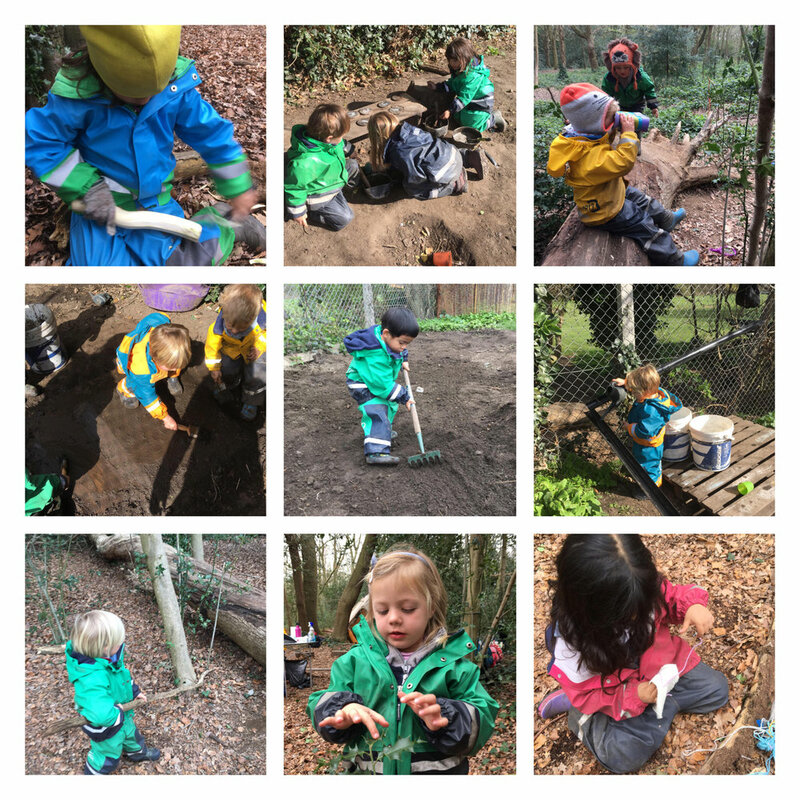 This week we have all enjoyed a new warmth from the sunshine and have really started to notice all the signs of spring surrounding us in the forest. Where there were tiny new buds last week there are now small leaves, blossom and larger shoots. The children are spotting new flowers popping up all the time and amongst all this growth they are also spotting more minibeasts! On one day, the children spotted some flowering nettles and went over to investigate. They talked about the colours of the flowers and the patterns on the leaves. Some of the children discussed whether or not the flowers would have a sting like the leaves do. One of the children then spotted a bumble bee, then 3 more different types of bees came buzzing along. We talked about the difference between honey bees and bumble bees and many questioned why honey bees make honey. Minibeast searching continued onto Putney Heath where the children used identification charts to discover the names of the creatures they had found. They naturally formed into pairs and small groups as they went off searching amongst the logs, leaves and flowers. They found slugs, woodlice, spiders, ants, ladybirds, moths, wasps, hoverflies, bees, midges, shield bugs, beetle larvae and lots of worms. It was great to see the delight in their faces as they were able to match up the pictures to what they had found. Some of the children were even able to start reading some of the labels on the identification sheets! Our go kart project is coming into its final stage as the children were supported to make the steering wheel. They took turns to saw sticks to the correct length before working together as a team to tie string around the sticks to form a racing car style steering wheel! The children are very excited and have been discussing what else needs to be done before it is finished. They have decided that we need to have the seat attached, the axels, lights and a rocket booster! This creativity has spread like wildfire this week as the children wanted to extend the skills they have learnt through using tools to create their own working models. Remembering what fun the children had with the Frisbee two weeks ago, the children decided they would make their own versions. With support from Mar the children wove bendy pieces of ivy around each other to make a circular frame. They then used twine and tied it back and forth across the frame in a criss-cross fashion to make the body. Once finished the children spent the next few days using their Frisbees on the field. At base camp this week we have enjoyed cooking over the fire and exploring all sorts of water play. They have used guttering to channel water from one container to another. They then used this complex system to add ingredients to elaborate potions with dramatic effects. One sip could turn you into a beetle, frog or goat! The children also filled pots, watering cans and cups and went around watering the tiny wild plants and shoots emerging around the site. Water was also used to mix with mud, dust and other natural ingredients to make awesome paint. The children then used large brushes to paint images onto logs, leaves and bare earth. As they explored the textures, shapes and patterns they noticed how their creations were changing before their eyes as the water slowly seeped into the earth and the paint dried often leaving something quite difficult to see. We would all like to welcome some wonderful new faces to the Little Forest Folk Barnes family. We have three new children joining us for their first days next week and the whole team, educators and little ones, are super excited to show them around the forest.